GalaxyZoo is a pretty sweet project. It lets your average Joe, i.e., non-astronomer, take part in astronomy research online by classifying galaxies (Quick! Is that a spiral or an elliptical?). Turns out there is no substitute for the good old human eyeball. Our windows to the world can spot unusual patterns in galaxies acutely and quickly; a lot better than computers. 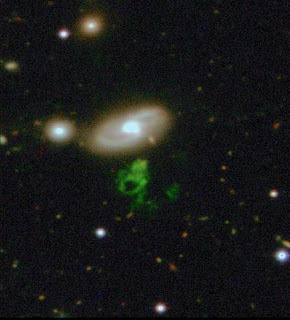 Perusing GalaxyZoo archives is how 25 year-old Dutch volunteer Hany van Arkel came across a strange image of a glowing, gaseous object with a hole in its center. This "cosmic ghost" became all the buzz after Hanny posted about the image. The astronomers who created and run GalaxyZoo realized that what she had found was indeed mysterious: no one had any idea what Hanny's Voorwerp ( Voorwerp means "object" in dutch) was. The excitement brewed as talk that she may have found a new class of astronomical object surfaced. Subsequently, astronomers all over the world peered through teleoscopes and analyzed data from satellites in space, trying to figure out exactly what Hanny's Voorwerp was. What they found was even more perplexing- the object didn't contain any stars. It was all extremely hot gas around 10,000 degress Celsius. So what was illuminating the mystery object, enabling scientists and Hanny to see it in the first place? Astronomers took a look around nearby for a source of illumination and settled on galaxy IC2497. They believe that galaxy IC2497 once contained an intensely bright quasar, small objects that are incredibly far off in space and are thought to surround massive black holes in the centers of galaxies. Futhermore, scientists think this quasar was so powerful that light from the past still illuminates the nearby Voorwerp, even though the quasar itself died thousands and thousands of years ago.